Companies have always been challenged to get the right information to make better decisions. The advent of Big Data & Analytics technologies changed the way how organizations manage data. 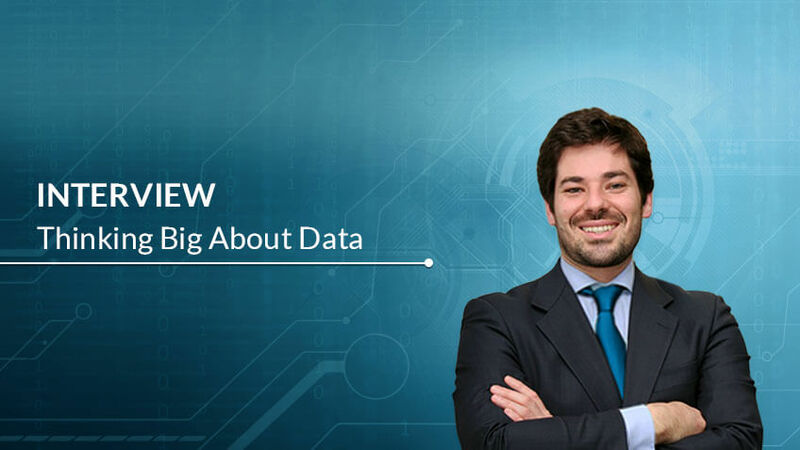 We interview Nuno Barreto – Partner & Big Data Lead @Xpand IT about how Big Data can help companies take advantage of their data to create business value? 1. How do you rank Big Data & Analytics in Xpand IT investment? Big Data & Analytics are areas where Xpand IT has invested significantly since 2012. We see it as a great fit with our company profile: very particular technical expertise required. Big Data and Analytics sales volume currently ranks second in the company overall sales. 2. What is Big Data after all? Some say there is no big data, only data. Do you agree? There is, in fact, Big Data! When “traditional” technology (e.g. RDBMSs) becomes insufficient to address the use case, either because it becomes too expensive or because it is just impossible, then it is Big Data. In other words, Big Data is technology – if you can define a solution by making use of data engines that are adequate for the Volume, Velocity or Variety of data involved, then you are handling Big Data. These technologies include the Hadoop eco-system or NoSQL databases (e.g. MongoDB, Cassandra). 3. Data in the enterprise is growing at an unprecedented rate, in particular, unstructured data. As a consequence, it becomes increasingly harder to make use of data and in particular make sense of it. How can you help companies address this issue? More than a matter of how to make use of it, most companies are currently not storing data they have access. They sometimes – I would say mistakenly – believe there is no value to be extracted from that data. One of the major advantages of technologies such as Hadoop is to allow for the enterprise to store high fidelity data at a very low cost. The decision if whether there is value or not can be taken later after the information is properly analysed and correlated with each other. Companies should make sure they store data so they can focus on analysing it and extract value from it. 4. What Industries can benefit from Big Data and Analytics technologies? There is an increasing range of industries that can benefit from using Big Data technologies, since the number of use cases these technologies address is also expanding. Naturally, companies that traditionally manage high (structured) data volumes are the ones that can more easily realize the potential: retail, banking, and telecommunication lead the pack. Notwithstanding, the sensors’ related use cases (IoT) open up the needs for Big Data technologies to a wider range of industries. 5. What are the technological elements that should be included in a Big Data strategy? The technological piece that is centric to any (Big) Data strategy is Hadoop. Its versatility (that keep being pushed and pushed), low cost and ease of growth are critical. Then, depending on use case details and specific requirements (e.g. latency) may justify the introduction of NoSQL engines. Again, in this regard, we highlight MongoDB for its versatility and integration capabilities with Hadoop. Finally, to glue it all together nicely, there is a need for a Data Integration tool that can communicate to all “legacy” systems and all the new Big Data engines. 6. What Big Data solutions are your customers looking for? What is the short-term trend? We work with very diverse customers in regards to what they do with Big Data technologies. We have customers making use of the schema-free features of MongoDB to deploy IoT backend, customers doing ETL offloading in Hadoop, using Hive, customers doing Analytics on top of Impala or clients using Spark and Kafka for real-time event processing. However, the Data Hub use case is gaining more traction as it is the base for further use case deployments. 7. What does Xpand IT has to offer and how does it fit customer needs? We believe our current services and products portfolio in Big Data and Analytics is very complete. Regarding skills, it pretty much covers the entire spectrum, from infrastructure architecture, setup, and deployment, including security setup to application development using Spark, Kafka, Impala, Hive, HBase, MongoDB, Cassandra and MapReduce to name a few. We partner with Cloudera, the leading Hadoop distribution, MongoDB, one of the most versatile NoSQL engines and Datastax, the commercial arm of Apache Cassandra, a great fit for some specific use cases. Our portfolio was carefully tailored to allow us to engage customers in various stages of their Big Data adoption journey so that we can build lasting partnership relationships with our customers.